Except for my iPhone 5S, I haven't upgraded the operating system of my mobile devices to iOS 8 yet. Maybe not yet until all the earlier hiccups are de-bugged. But this would be handy once I've decided to upgrade. I'll keep this for my future reference. With Yosemite, Apple has tried to make it easier for you to move files between devices. This is something we've been able to do with File Sharing between Macs and PCs, but now we have the option to move files between Macs and iPhones, iPads, and iPod touches running iOS 8. On your iOS device running iOS 8 or later, swipe up from the bottom of the screen. You'll see an AirDrop entry. Tap on it and you have three options -- Off, Contacts Only, and Everyone. Off means, that this device will be invisible to others using AirDrop. If someone who've you added as a contact on your iOS device would like to transfer a file, they can when you select Contacts Only. The Everyone option lets anyone use it. We'll choose Everyone. Now let's move to the Mac. 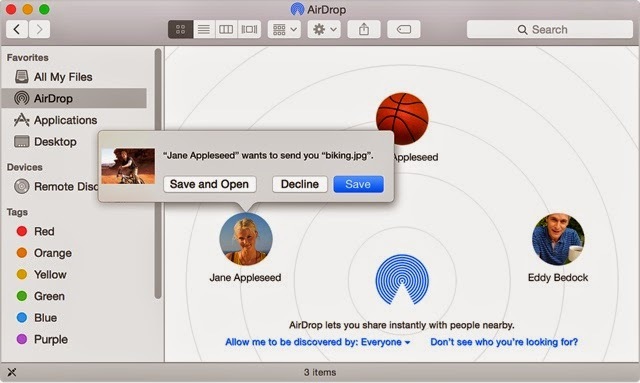 On your Mac, open a Finder window and select AirDrop. Anyone around you using the same Wi-Fi network that has AirDrop enabled for Everyone (or if you're in their contacts) will appear. To copy a file from the Mac to the device, just drag the file on top of their icon. The recipient will be asked if they want to accept or decline the transfer. When they accept, the file is copied to their device. To go in the other direction -- from iOS device to Mac -- select AirDrop on the Mac and configure the Allow me to be discovered by option. Let's choose Everyone. For this to work we must keep this window open as that tells others that we're open to an AirDrop transfer. On the iOS device, choose a file that you want to transfer, tap on the Share menu, and you should see the person or device you wish to transfer the file to. Tap on their image and the file will start to transfer. The person receiving the file can choose to save or open the file, decline it, or save it. The received file will appear in the Mac's Downloads folder.